A food trip to Italy is a trip to my childhood. Every Sunday we would have "gravy" for dinner. My mother must have prepared this dish at dawn because it was always simmering on the stove when we came home from church about 11 am. The rich smell of meats slow cooking in tomato sauce would permeate the house. No one could resist dipping a piece of Italian bread in it… sampling just a little, in anticipation for dinner that evening. 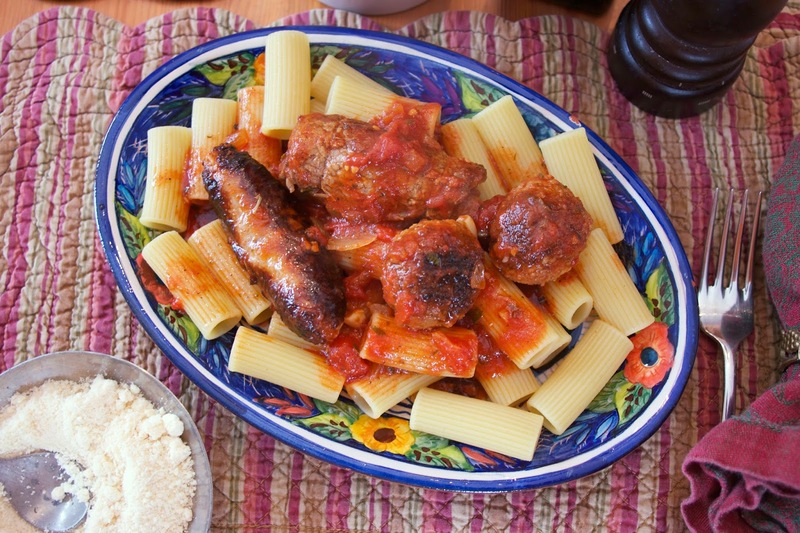 Why did Italian immigrants call the "red sauce" we eat over pasta "gravy"? My guess is because it is made by slow cooking meat in tomatoes; they chose to translate it to gravy meaning "meat sauce". My mother's family comes from outside of Naples, Italy and it is my belief that the Italian-American Sunday Gravy is a version of the Neapolitan Ragu which can be made by cooking a variety of meats slowly in a tomato sauce. The Italian-American version is usually made with: sausage, meatballs, and Braciole pronounced Brajole, which is thin steak seasoned with cheese and spices and rolled up and secured with twine. I made a slow cooker version of this meal because I just feel more comfortable going in and out of the house with a crockpot on than the stove. I just made this meal for a group of old friends and served the gravy over homemade pasta with garlic bread and a salad. However you choose to serve this dish it is truly the ultimate Italian-American comfort food. 2 pounds Braciole: made from thin slices of beef any cut. I usually use flank. 1/2 cup fresh minced Italian parsley for sauce a little more for the braciole. 1) Make the meatballs click here for my simple meatball recipe. I make these the day before. I pack them tighter than usual and freeze them, so they will keep their shape. You can use store bought frozen meatballs. Put them in the gravy frozen. 2) Make the Braciole. Pound out the meat. Remove any scraps of fat. The pieces should be pounded to about 1/4 of an inch thickness. Sprinkle salt pepper, grated parmesan cheese and minced parsley on the meat. Roll it up and secure it with twine. You can make these between 3 to 6 inches long. I usually cut them in half, I like to serve smaller ones. 3) In a large skillet in EVOO and a little vegetable oil, on medium high heat brown all of the meat. About 3 minutes per side. You are not cooking the meat through, just browning the outside. Put the browned meat in the crockpot. 4) Pour the red wine into the skillet after you have browned the meat and turn up the heat to high. Scrap the brown bits from the meat and lower the heat until the wine reduces a little. Pour this reduction over the meat. 5) Add about 2 tablespoons of EVOO to the skillet and saute the onions and garlic. Do not brown the garlic. Add the spices: red pepper flakes and Italian seasoning mix, so their flavors will bloom. Mix in the tomato paste. 6) Pour in the cans of tomatoes and break up the whole tomatoes while you stir, leave some chunks. Add the parsley and sugar. Heat the sauce though and then pour it over the meat in the slow cooker. 7) Give it a little stir and cook for 4 to 6 hours on low, or put it in a slow cooker, brajole first, then sausage, with meatballs on top. Cook on low for 8 to 10 hours. Serve over pasta with garlic bread for dipping and a big Italian salad. Come join us on March 11th when we visit Ireland! I love traditional Ragu. There is a family style Italian restaurant here called Carmine's and I love their ragu with the variety of meats you get. I must try this slow cooker version! I know Carmine's great place. I love how close you still are to your heritage. I feel mine is very far in the past, so cultural traditions weren't kept with my family. This looks perfect for a Sunday dinner. I can almost taste it through my screen. It is easy when you grow up living next door to your Italian grandmother. A little more gets lost each generation. Your Neapolitan Ragu looks delicious, we would really enjoy this dish! Thanks for sharing and have a great day! Thanks Miz Helen... I really loved the Italian dishes I've seen.. great selection this party. Diane, this sounds delicious! :) Certainly a dish my family would enjoy! 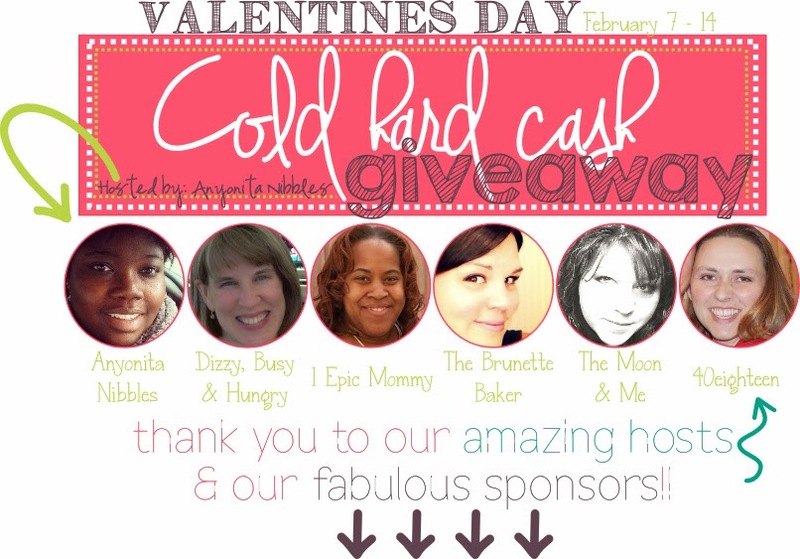 :) Thanks again for letting me co-host with you! So excited about htis party! Me too.. I think it's catching on and I love learning about other cultures. The dish looks delicious . would prefer to make some thing like this when i dont feel like cooking . Thank you for sharing the recipe and happy to co-host with you . It does take a little preparation but it is a great meal to make when you don't want to be cooking when guests arrive. I have been wanting to learn more about Sunday gravy. My husband would love the Braciole. I hope you try it. It is hard to go wrong with this meal. A real crowd pleaser. Thanks for pinning Deb. I could eat this everyweek. Oh, wait I did growing up! So true, so true... in every culture and in every cuisine. 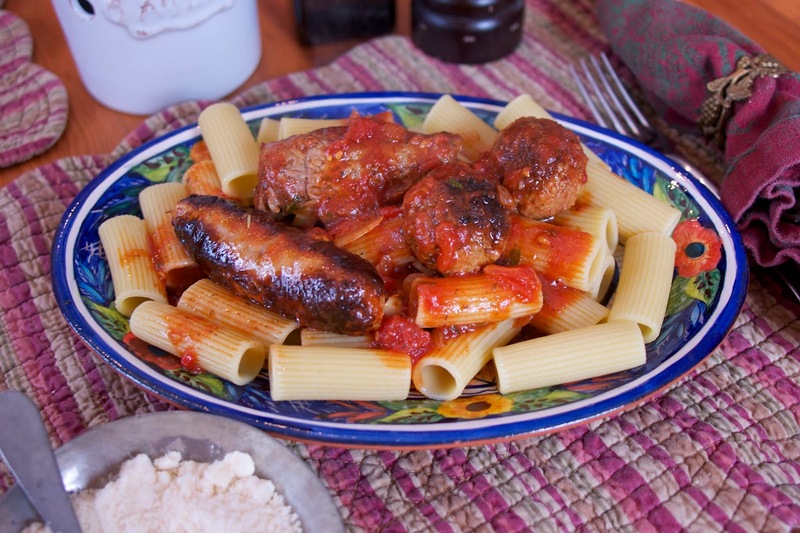 I love traditional family recipes like this, Diane :-) Your Neapolitan Ragu looks really scrumptious!